Lens Description: The Schneider 100mm f/5.6 Apo Digitar N Lens is a telephoto large format lens specifically designed for use with digital backs, which require extremely resolved, color correct image circles of a smaller size. Digital backs also benefit from use at larger apertures to avoid image degradation from diffraction. 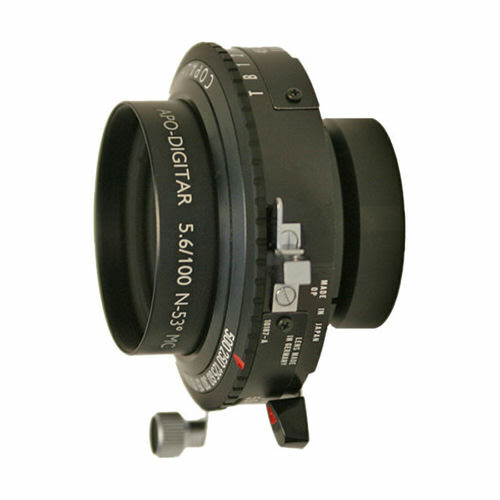 This version of the lens is mounted to a conventional Copal #0 shutter.rnrnThe 100mm Digitar is appropriate for use with backs as large as 63x63mm, and upon such backs it records an image area similar to that of a 89mm lens upon a 6x6 format camera. It is an ideal slightly long general purpose lens for both field and studio work, remaining sharp at a broad range of reproduction ratios. Its 100mm image circle size remains at all apertures, even f/5.6, and because the image circle never shrinks it can also be used in front of 6x7, 6x6, and 645 format film backs to provide superior image quality versus any medium format SLR lens.